Yaho, Astroworkers! p0rk1ns here with another weekly update! Charles & Charlie are the lifeblood of any factory. Without their hard work, you’d be lugging all of your ingredients and soup around- but you’ve got better things to do! Our most dedicated of factory robots have received some great updates this week that will make them even better helpers in our conquest of the galaxy! For starters, previously Charlie & Charles, consummate workers that they are, would continuously walk in the same direction when you put them down. We’ve updated their circuits so that when you put them down now they will continue along the direction that you are facing (or the direction of your mouse cursor). Their dedication to making soup also caused some weird behavioral bugs that have been squashed, too. When trying to get past our new traffic robot Jimmy, C&C would sometimes get stuck walking past him. We’ve tidied up their “Respect My Authoritah!” code and they’ll now follow Jimmy’s instruction to the letter. Finally, we’ve made improvements to the HUD to help you understand just what your dastardly rivals are up to. When customers receive shipments of rivals soups, you’ll now see their reaction, for example “Yummy!”, and you’ll see the percentage that their market share has increased. The HUD will now display customers reactions to your rivals soups and how much market percentage each gains. After picking up Charlie & Charles, they will now start walking in the direction that are facing when you place them. Fixed a bug that would cause Charlie & Charles to get stuck when trying to deliver something past Jimmy. Fixed a bug that would cause Charlie & Charles to get stuck when encountering a hole in their path. We want to remind everyone that you can still submit your data to us if you’d like to see your company in the game as a rival soup company! Check out our announcement on Steam for more details. 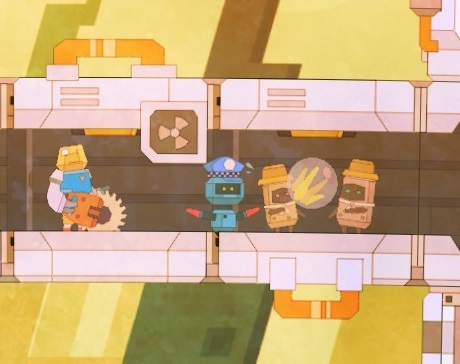 We also did an interview with GameRamble about some of our influences for Nom Nom Galaxy! First, allow me to introduce myself! Mass1ve, Strategic Operations Sub-Manager here. As SoupCo grows by leaps and bounds thanks to your efforts, we wanted to give you more ways to use your noodles (the non-soup ones, that is) and expand that market share, while at the same time snatching away your rival’s share like a rabid squidfly. 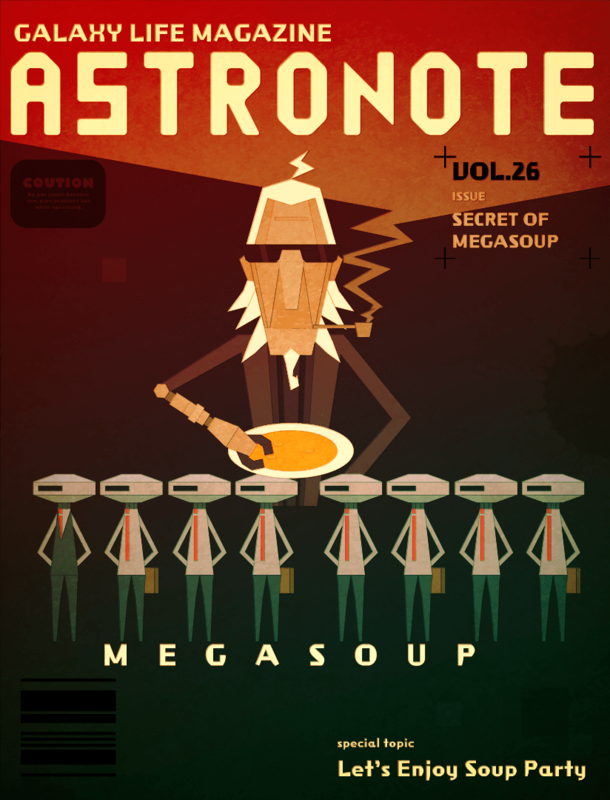 To that end, the heights of SoupCo’s technological genius are being brought to you in a number of new changes! 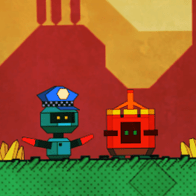 First, some exciting news from our robot division-TWO new robots have been developed to help you bring that SoupCo flavor to the far reaches of space! Say hello to Jack and Jimmy! Jack is a real firecracker, and by that I mean he’s an extremely high output demolition module. 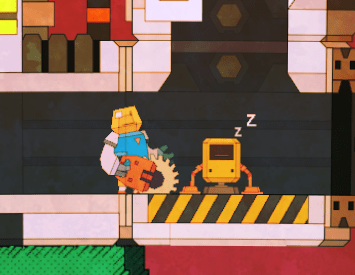 He’ll help you take out that pesky bedrock that your buzzsaw couldn’t handle, as well as anything else nearby, so exercise caution! …and where are you going? Using some leftover soup cans, we gave Freddy an upgrade so he can now be turned on or off with a quick jab. But don’t worry- he’s a tough one, so to him it’s just a light tap! Next, “Yummy!” is now decided by ingredients, and not by soups. For example, once a soup using Tomaty triggers “Yummy!” (Red Corn for example), you can then send any soup that uses Tomaty (like Tomaty Plus or Tomaty Squeeze) and reap the benefits! Risking it all for deliciousness! 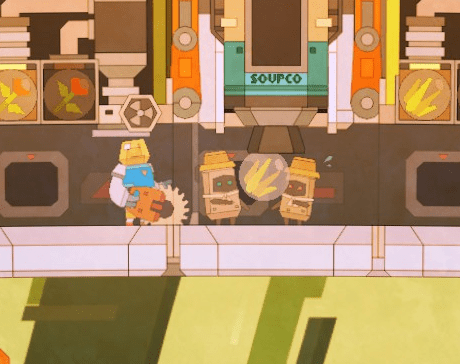 And now for a BIG one-we’ve added a combo system to soup delivery! Sending soup quickly while customers are still floored by the flavor of the last soup means your market share will increase more and more! Finally, until now “Yummy!” and Fever Time were separate for you and your rival, but thanks to the SOUPCO Spacetime Division, these are now shared, along with the new combo system! This allows for a new level of strategy as you eye your rival more closely and decide whether to take advantage of their hard work, or break their combo with random cans of Grass Stew (heh heh heh). Added Jack, the bomb robot. 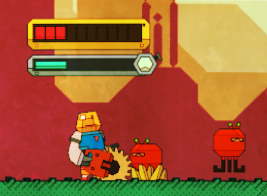 When Jack is hit (punch, buzzsaw, or enemy attack), he’ll start a countdown and then explode. In addition to breaking ground and damaging enemies (and you and your factory if you’re not careful! ), the explosion will also destroy rock that can’t be broken with the buzzsaw. Added Jimmy, the traffic control robot. Charles and Charlie will make a U-turn when they run into Jimmy, so he can be used to control their range of motion more precisely. “Yummy!” is not determined by ingredients, and not by soups. 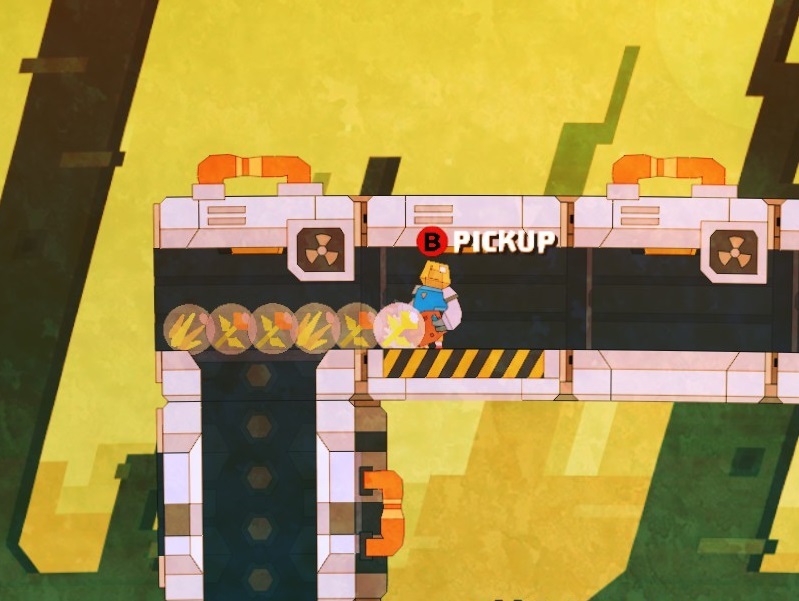 A combo system has been added to soup rocket delivery. If a soup is delivered within a set time frame after another soup, it will form a combo and the amount that market share increases will continually rise. Currently, the combo window is active while the “Yummy!” display from the previous soup is on screen. Yummy, Fever Time, and combos are now shared with rivals. Your benevolent Middle Manager p0rkins, here. This week we have some cosmetic changes that will make pushing your soup cans into the hungry gullets of customers just a little bit easier! 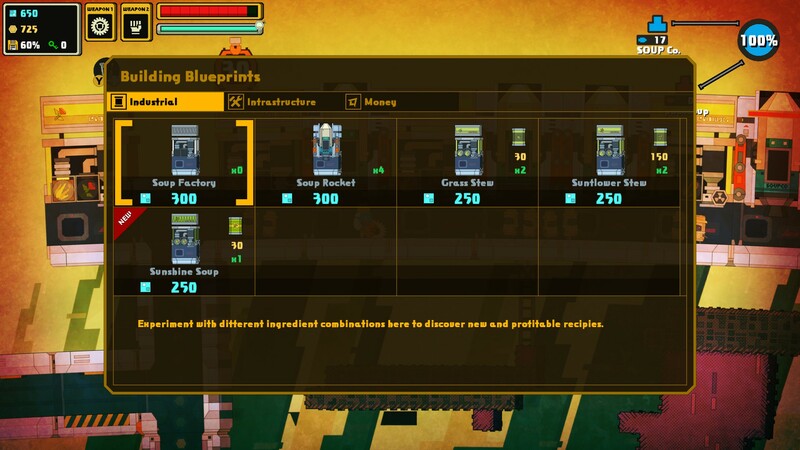 The building menu now displays how many of each type of factory or soup rocket you have and lists the selling price on the galactic market. This will make planning your soup production much simpler. Found a recipe that sells for 50g or 150g? Make a farm and take advantage of it! 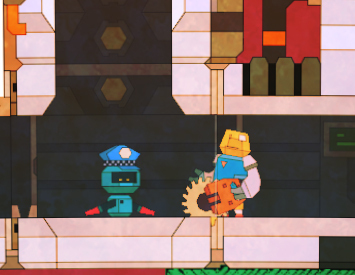 Other spiffy changes this week include highlighting objects you can interact with while you are standing next to them. When you’ve got a bunch of items laying around and break time is just around the corner, it’s best not to waste valuable seconds looking for the right ingredient! 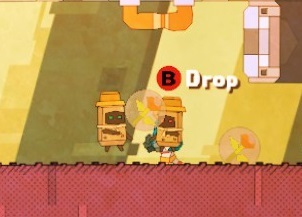 Finally, since we love our robots and always treat them tenderly, we changed the “Throw” hint to “Drop” when carrying them. This week brings yet another round of glorious changes to improve company morale and productivity! Last week we hinted upcoming changes to expand the community and multiplayer aspects of Nom Nom Galaxy. We’ve continued on that journey in this patch with a few changes you’ll see when you update. When you select a planet to play now, you’ll be taken to a screen that show a leaderboard for the planet. From this screen you’ll be able to select the rival company you’ll compete against. This ghost data will then be used to create your opponent. Previously, we used your most recent ghost data from a previous play session to create the MegaSoup Co. Now we’ll be using other Astroworker’s data, so you’ll have to step your game up! Because of the changes in the save system, any of your previous saved data will be lost. This means that if you had a game in progress before, it will disappear. We’re sorry to bulldoze your factories, but it’s all in the name of PROGRESS! For now, we’re only using ghost data we’re collecting in the office. In the future, we’ll allow players to upload their ghosts to share with players around the galaxy. One of the features often requested is the ability to continue working on your base after you’ve reached 100& Market Share. Now when you conquer your rival, you’ll be taken back to the main menu where you can select “Continue Work” to keep working on your base. You’ll be given the option to select a new rival company and start the game over with your market share reset. You can now spent money to reload your Missile and Shot towers! This will eliminate all of the dead towers littering bases. In order to accommodate the new ghost data system, saved data from previous versions will not longer work. Added Rival Company selection screen when you start work on a new planet. Select “Start “Work” after the planet selection screen to chose a rival. Use LB and RB to switch rival sorting options on the Xbox 360 controller. Click the column to sort with a keyboard and mouse. Players can now continue using their base after achieving 100% Market Share by selecting “Continue Work” from the menu. Added limit of 15 missiles to Missile Tower. Missiles no longer go through walls. Fixed some strange behavior for missiles. Added a reload option to Missile and Shot Towers. Access the Maintenance Menu and press “Left on the d-pad” for controllers, or Q+A for mouse and keyboard users. Fixed issues where rival’s graphs were not being saved correctly.